We believe retirement life can be lived in style, comfort and beauty while fostering rich experiences in art, nature, family and friends in a peaceful retreat-like setting. Small pets welcome. 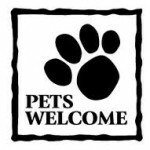 Enjoy our special pet walking and play space!